Belting questions ranging from Bookends to Breaking Bad. 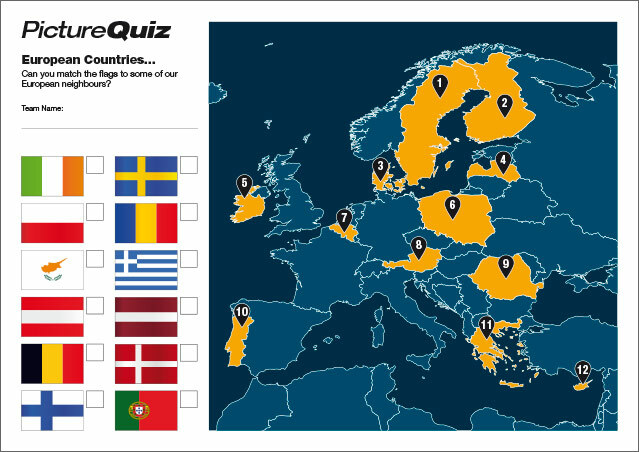 The Picture Round is match the flag to the Euro Countries and the Wild Card is a date dilemma from Ridley Scott’s movie Prometheus. Q09. Truss, suspension and cantilever all kinds of what? Q14. Which American duo released the 1968 album Bookends? Q26. In which sport might you unluckily find yourself being left with bedposts? Q39. In Breaking Bad, who was the Chilean drug kingpin that ran Los Pollos Hermanos? Here’s a low-res sample of the Euro Countries Picture Round, click for a higher resolution version. The Picture Round download is a two page high quality PDF with the answers on page 2. The Wild Card for Quiz 053 is a date dilemma from the Ridley Scott movie Prometheus.